You may remember the denim that we carried a few years ago. It was great, except when it wasn't. There were periodic issues with the quality, and we finally gave up on it. Well, we have some good news. We've found a high quality replacement from a new company. Twelve colors of this lightweight denim came in last week. If it proves to be popular we'll order others. At 60" wide and only $15.99/yard, it's great for tote bags, camping/outdoor quilts, clothing, home dec, and more. Come check it out. The new line of bernette machines are out. They're designed by BERNINA, easy to use, and easy on the pocketbook. 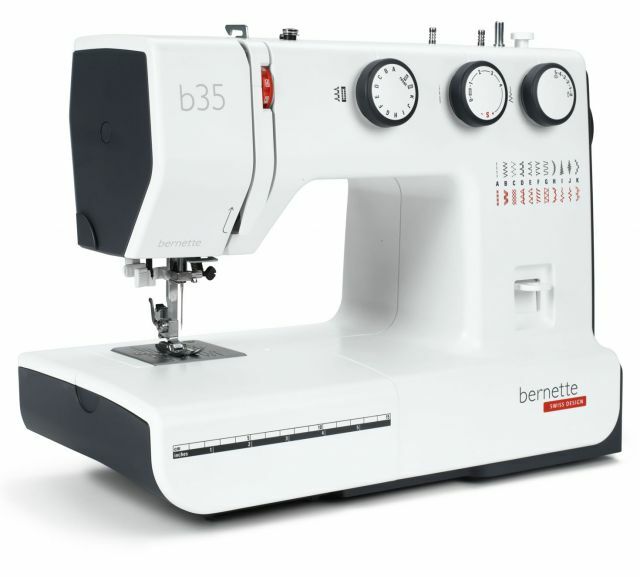 Great for new sewists, children, or anyone who needs a basic machine for everyday sewing. They also make great second machines to travel with. The quality of a bernette is far better than that of a machine you might purchase at a "big box" store. They're backed by a five-year warranty and can be serviced by the certified technicians at Cortez Quilt Company. The first machine shown above is the bernette 33. It includes 15 stitch patterns, sews at 860 stitches per minute, and comes with 5 presser feet. Price: $269. The second image is the bernette 35. It has 23 stitch patterns, 7 presser feet, and also sews at 860 stitches per minute. Price: $339. 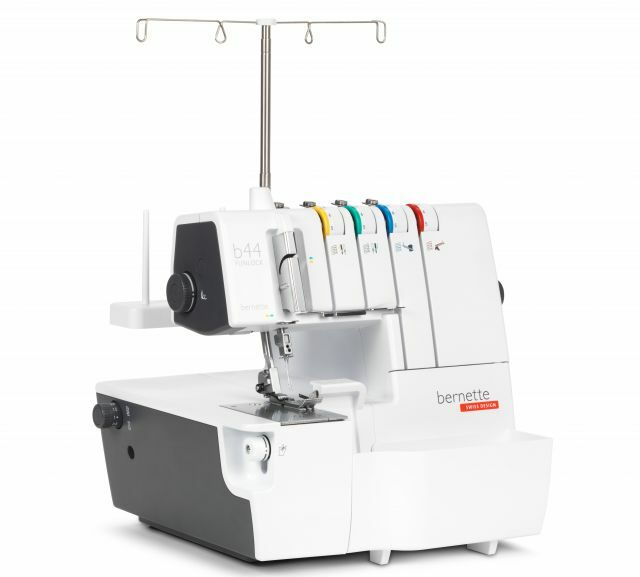 And finally, this is the bernette 44 Funlock serger. The color-coded threading path makes it easy to use. It offers 2, 3, and 4-thread overlock stitches, 3-7 mm wide cover stitches, and sews at 1,300 stitches per minute. Price: $599. 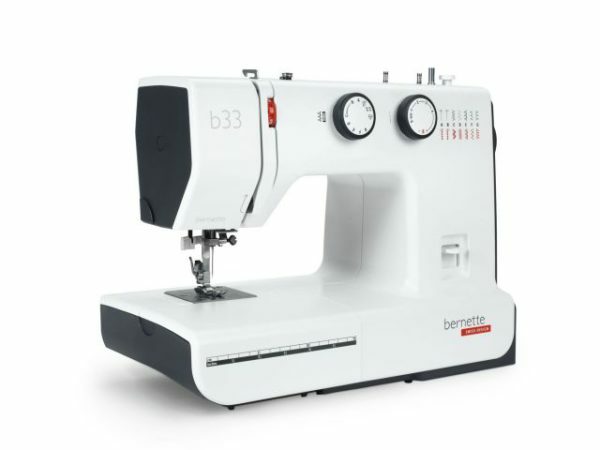 Save $1,000 on a BERNINA Q20! Take advantage of this summer sale that runs June 29 through July 10. 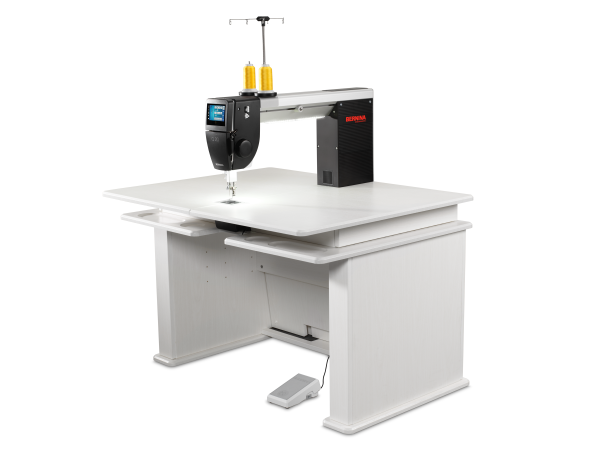 Take $1,000 off the beautiful and amazing BERNINA Q20 sit-down long arm machine when you purchase it along with a ruler work kit. If you've had your eye on this machine (you know who you are!) come in starting this Thursday to make your purchase and save. This machine is delivered directly to your home and one of our certified technicians comes out to assemble the Koala table (included and available in several finishes) and set up the machine. Just think of the quilting you will do with the BERNINA Q20! 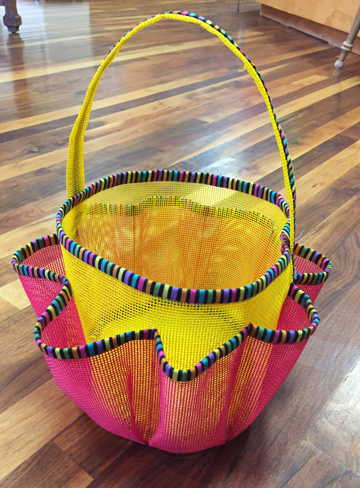 The pattern is called “Shower Caddy” and, indeed, this would be a great little basket to carry to and from the shower when you’re at a camp site. But it would also make a great organizer for sewing notions, office items, or art supplies. We have the vinyl in every color available. 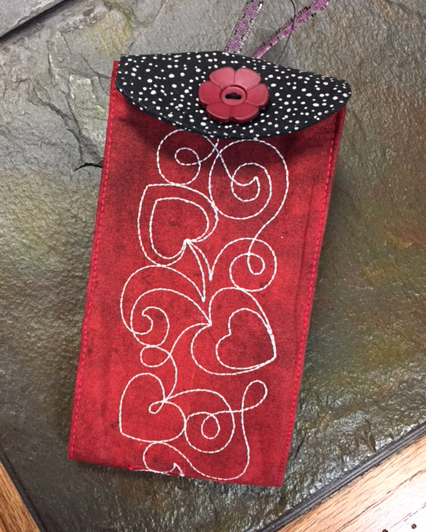 Tricia will teach this fun “make & take” class. Join us for a fun sewing day that requires little brain power and results in quilt blocks that you can put together in a variety of ways. Choose from eight different recipes. 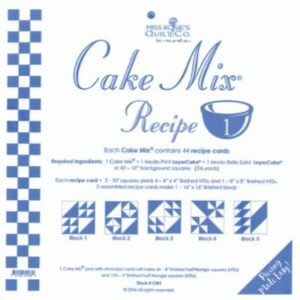 You’ll need one layer cake (forty 10″ squares), 3 1/8 yards of background fabric, and thread for piecing. That’s as complicated as it gets! These large totes are completely lined with vinyl mesh making them sturdy and easy to keep clean. 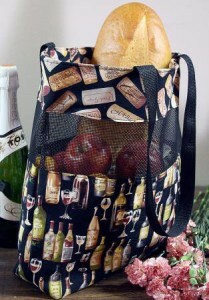 Perfect for taking to the supermarket or farmers market, for carrying supplies to quilting and knitting classes, or packing for a picnic. Make one or more in this full-day class. We keep many colors of the vinyl mesh in stock. Click here to see the full quilt shop class schedule. Take your crochet skills to the next level by learning a variety of new stitches in this two-hour class. You should know how to chain, single, and half-double crochet to attend. Bring yarn and the appropriate size crochet hook. Sue Maxwell will teach this class. 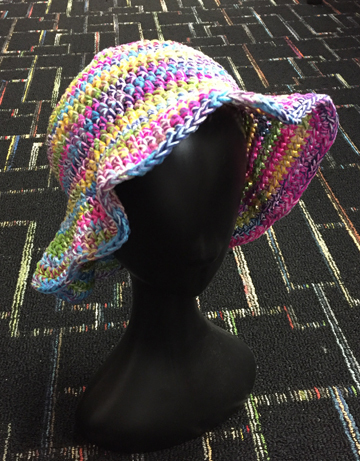 Crochet this easy, fun hat with colorful Australian yarn. Perfect for the pool, the beach, the garden, or any time you’re in the sun. Adult or child size. 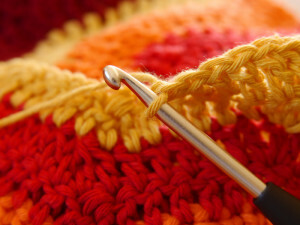 Participants should know basic crochet stitches: chain and half-double crochet. Recommended yarn: Queensland Cairns, 1 skein, $14.99. Size J crochet hook needed. Sue Maxwell will teach this class. 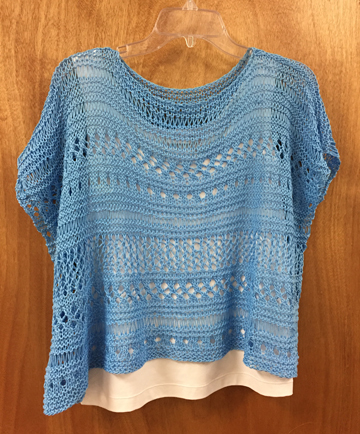 10:30 a.m. – 5:30 p.m.
Plus a follow-up session on Friday, July 21 from 1:00 – 2:30 p.m.
Make this darling top while learning several new lace stitches. Recommended yarn is Tahki Cotton Classic Lite (in stock here) or other DK or sport weight yarn. You’ll need approximately 500 yards. Bring (or purchase here) size 7 or 8 needles, straight or circular. Students should know how to cast on, knit, and purl. Sue Maxwell will teach this class. Sign up today! See the full yarn shop class schedule here. Make this cute embroidered pouch with us on June 27. It has a pocket on both sides and a pouch in between. Carry up to three pairs of glasses at one time! Bring to class: Machine with embroidery unit, large oval hoop with plastic template, USB stick to transfer design (design provided). 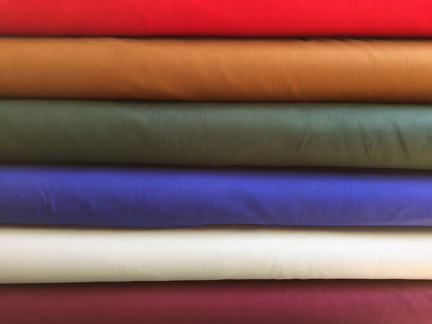 Supplies needed: Two fat quarters, 5/8 yard LUXE Allure Extra Firm Interfacing (LX834), Heavy Weight tear-away stabilizer (10″ x 22″). We have all supplies in stock. To register please call 970-565-7541 or email Cindy. Couching, the process of adding a yarn or other embellishments to a fabric surface, is a great way to add texture, color and dimension to any project. 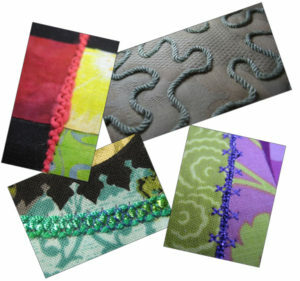 Learn to create couched flat braid, raised twisted cords, corded hem-stitching, and free-motion couching. We’ll experiment with several different presser feet used with couching. A variety of yarn sizes paired with the appropriate foot can work wonders for just the right amount of embellishment. Please bring show and tell items for additional chances at the door prize. Bring a friend. Owners of all brands of machines are welcome. To register please call 970-565-7541 or email Cindy. This tip comes courtesy of We All Sew (BERNINA). Listening to podcasts while you sew is a great source of information and entertainment. Click here to read the tip which includes how to access podcasts and recommendations for ten interesting ones for you to check out. Enjoy! This beautiful 100% cotton yarn is what was used to make the cute Cancun Lace top shown in the class section above. Take 20% off the yarn and sign up for the class! Offer expires on Saturday, July 1 at 6 p.m. Limit four per person. You must mention that you saw this offer in the Quiltzette to receive the discount.